Home»Coffee Grinders»Mocha-Latte Blanco Recipe – Truly Tasty!!! A Mocha-Latte is like a latte, it is typically one third espresso and two thirds steamed milk, but a portion of chocolate is added, typically in the form of sweet cocoa powder, although many varieties use chocolate syrup. 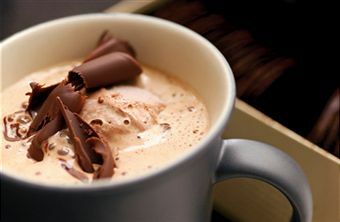 Mochas can contain dark or milk chocolate. Like capppuccino, mochas-latte contain the well-known milk froth on top, although they are sometimes served with whipped cream instead. They are usually topped with a dusting of either cinnamon, shredded chocolate or cocoa powder. Marshmallows may also be added on top for flavor and decoration. Try this Mocha-Latte Blanco recipe, it’s a favorite at our house and your guests will love it. Place milk and water in medium sauce pan. Bring to a boil. Remove from heat; add white chocolate and whisk until melted and smooth. Whisk in Brandy or other hooch, coffee granules and vanilla extract. Return to low heat for 1 minute, whisking constantly until frothy. Serve warm. I love coffee and “hooch” added together!